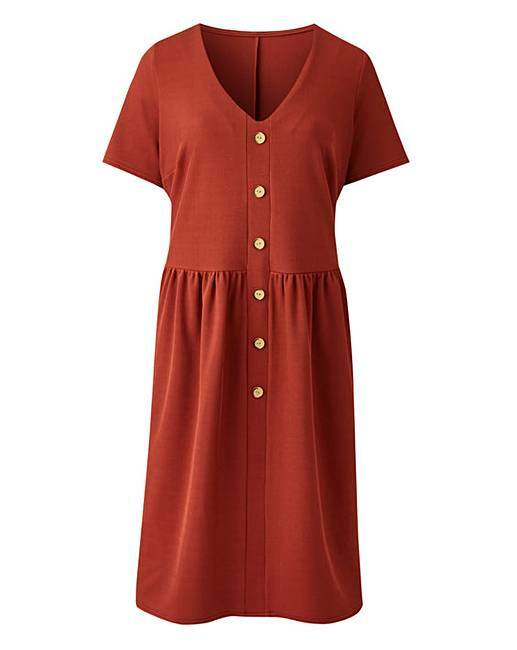 Button Through Ribbed Jersey Swing Dress is rated 3.8 out of 5 by 4. This easy-to-wear swing dress is a must- have for every woman's wardrobe. In a stretch ribbed jersey fabric, this super-cute dress features a v neck, short sleeves, front button detailing and peplum waist. Team with your favourite ankle boots for the perfect casual look. Rated 1 out of 5 by Kate from Bobbling after one wear Looks great, but is terrible once worn. After half a day's wear it has already bobbled. Rated 5 out of 5 by LMH07 from Fab dress Simple and stylish. A great dress to throw on with a chunky cardigan and boots. I also have this in the black and it's equally as great.